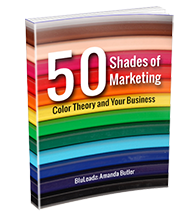 Download 50 Shades of Marketing Today! Does Your Website Need A New Hue? Do you know what colors you should be using on your website? Who needs gray when there are so many other colors in the gamut? If you're looking to spice up your website or even encourage certain kinds of interactions, why not introduce some color theory? Having the right colors on your website can help to increase your conversions, leads and customers! Colors evoke emotion—which your site can use! Intelligent use of color can help your business grow!